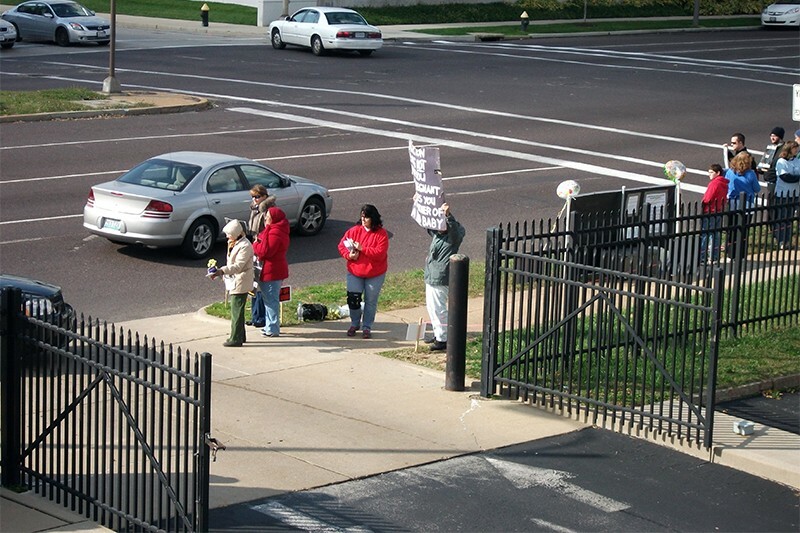 Anti-abortion protesters gather at Planned Parenthood in CWE in 2016. 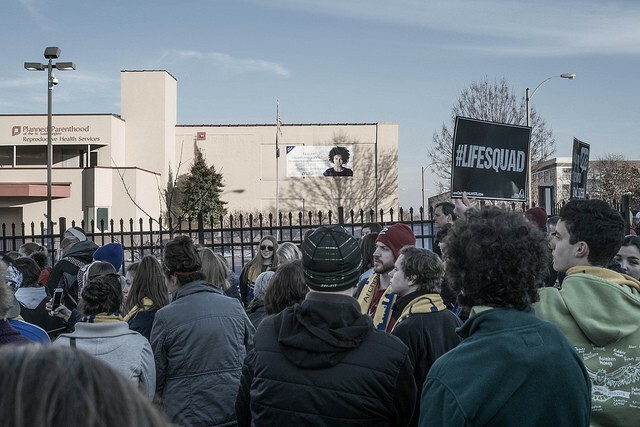 The driveway outside St. Louis' sole abortion clinic has long been a battleground for the rights of anti-abortion protesters and the clinic's patients — and now it will remain so for the foreseeable future. Today, the city's Board of Aldermen voted down a measure that would have created an eight-foot buffer zone at the entrance to the Planned Parenthood clinic in the Central West End. And since today's meeting is the final one in this aldermanic session, that's it for now. The effort to pass a buffer zone law has already lasted several sessions — a previous version of the bill failed to pass committee last year. But this year's version, sponsored by Alderwoman Christine Ingrassia, seemed poised for break-through. In February, it garnered first-round approval of the full committee by a fifteen to thirteen vote. When the NARAL-endorsed Annie Rice was sworn into office just days later, the votes seemed to be all set. But today, the vote broke in the other direction. Four former "yes" votes failed to cast votes today, and four other members — north-city aldermen Lisa Middlebrook, Brandon Bosley, Sam Moore and Terry Kennedy — flipped their votes to "no." The final roll call was fifteen opposed, nine in favor. The driveway leading into Planned Parenthood's clinic is frequently crowded by protesters. Prior to the vote, Ingrassia told the chamber that conversation about the issue was important to public safety. According to St. Louis Public Radio's Rachel Lippman, Ingrassia added, "Not passing this is not a failure." While debating the bill, several aldermen questioned with the legality of restricting protesters' First Amendment rights. They also asked whether it was proper to single out Planned Parenthood for special protection. 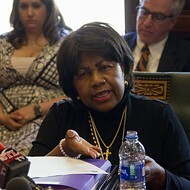 Supporters of the bill, however, pointed out that the buffer zone was crafted to protect patients from a pattern of harassment that's been a fact of life at Planned Parenthood for decades. Every day, protesters congregate at the clinic's driveway, where they confront patients as they park inside the gated lot. Planned Parenthood officials say those protesters often approach vehicles attempting to make the turn, or even outright block the driveway. Prior to the vote, Ingrassia indicated she was willing to introduce the bill again next year, tweaking it if necessary. The measure was modeled after a Colorado law upheld by the U.S. Supreme Court. In a tweet following the vote, Alison Dreith, executive director of NARAL Pro-Choice Missouri, blasted the members who'd flipped: "Today, several people flipped their vote on buffer zone to play politics at the expense of women’s health. You should come with a solution or be ashamed of yourself." 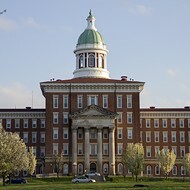 In a statement, Planned Parenthood said it was "committed to safe access for patients, staff, volunteers and protesters at St. Louis health care facilities, including ours. Board Bill 34 accomplished that, balancing safety concerns with First Amendment rights. Although the bill did not pass, we will continue to back policies to improve access while supporting the rights of free speech in our community."